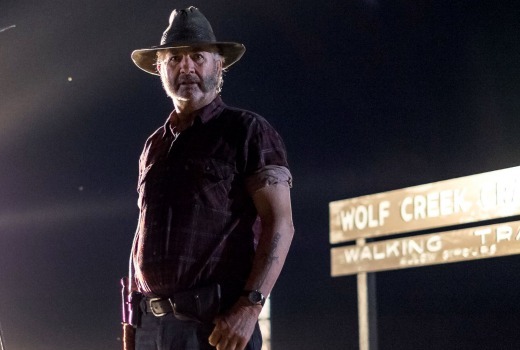 Production has begun in South Australia on season 2 of Wolf Creek for Stan, directed by Greg McLean. John Jarratt reprises his notorious screen villain Mick Taylor, with new cast members Tess Haubrich (Alien: Covenant), Matt Day (Rake, Paper Giants, Underbelly, Kiss Or Kill), Ben Oxenbould (Comedy Inc., The Kettering Incident, The Code), Laura Wheelwright (Animal Kingdom), Stephen Hunter (The Hobbit, The Leftovers) and veteran Chris Haywood (Shine, Muriel’s Wedding, Dogs In Space). In the next six-part series, Mick Taylor sees an opportunity of a lifetime after a chance encounter with a coach full of tourists from around the globe. But the unwitting travellers begin an outback adventure none of them could have imagined. McLean is showrunner as well as director, alongside award-winning filmmaker Kieran Darcy-Smith (Wish You Were Here, Jack Irish) and the hugely accomplished Geoff Bennett (The Secret Daughter, Love Child, Brock). Lisa Scott (Anzac Girls, Janet King) and Kerrie Mainwaring (The Secret Daughter, Peter Allen: Not The Boy Next Door) are producers for the series. Executive producers are Rory Callaghan, Greg Haddrick, Greg McLean, Nick Forward and Rob Gibson. Nick Parsons, Shanti Gudgeon and Mark Dapin are the writers on the series. Wolf Creek ss a Screentime (a Banijay Group company) production in association with Emu Creek Pictures, financed with the assistance of the South Australian Film Corporation. International sales are being handled by Banijay/Zodiak. Great series. Whenever we get visitors from overseas and they head off on bush trips, I always get them to watch the First Wolf creek film…..and then tell them not to worry……too much!!! !